Rick and his family are helpless under the boot of Negan and his army, as the sadistic killer takes the life of one of their own -- and then tries to break Rick's will permanently. Carol awakens to find herself with Morgan inside the Kingdom, a protected community led by the eccentric King Ezekiel. While Carol plans for her future, Morgan has another encounter with the Saviors. Dwight survives in captivity at Negan's compound, where a conflicted Dwight works to slowly break him. Rick and the other survivors in Alexandria try to hold it together when Negan and the Saviors show up to collect their payment. Outside the town's walls Michonne finds her nerves shaken, while Rosita and Spencer go in search of a lost item. Maggie receives a less than warm welcome at Hilltop, where the town's leader Gregory continues to find himself under the oppressive control of the Saviors. Carl follows Enid when she decides to leave the safety of Alexandria. After being separated from Heath during their weeks-long scavenging run, Tara stumbles upon a hidden community of women who are determined to kill her rather than let her go with knowledge of their existence. After Carl's infiltration of the Saviors' stronghold goes sideways he finds himself at the mercy of Negan, who decides to take him under his wing and show him around. While Rick and Aaron take new risks to find something for Negan, Rosita has her own mission for Eugene. Aaron and Rick go to great lengths to secure new supplies, unaware that Negan and the Saviors are waiting for them back home. While more than one person plots to take out Negan, Spencer makes a play to get on his good side. At the Saviors' compound, Daryl finally makes his escape. After a less than warm reception from the leader of Hilltop Rick and the group travel to the Kingdom, where Jesus introduces them to King Ezekiel -- who they ask to join them in an alliance against the Saviors. While searching for Gabriel, Rick and his group try to strike a deal with another hostile force. Elsewhere, Richard ties to convince Daryl to help him push the Kingdom into war with the Saviors. Eugene attempts to navigate the treacherous world of the Saviors and be what Negan wants in order to stay alive. Meanwhile, Dwight revisits a difficult past after he is tasked with bringing back Sheri. Michonne and Rick enjoy some time alone on the road searching for guns and supplies, resulting in an unexpectedly close call. In Alexandria Rosita faces a decision about her next course of action. As Morgan and Carol struggle over whether to stay out of the war their friends in Alexandria are about to start, the Kingdom faces dire consequences to its relationship with the Saviors after a routine meeting goes wrong. As Rosita and Sasha plan their own secret mission to take out Negan, Hilltop is surprised by a visit from Simon and the Saviors -- who are looking to take more than supplies. 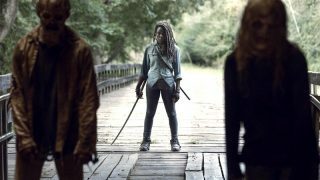 Sasha finds herself a captive inside the Saviors' compound, where Negan offers her a deal to join them. After Tara reveals the existence of the Oceanside community, the Alexandrians make a play for their guns. With an offer of help from an inside man and backup from the Scavengers, Alexandria prepares to take a stand against Negan when the Saviors return. Holding on to her memory of Abraham, Sasha embarks on a desperate gambit to help her friends.